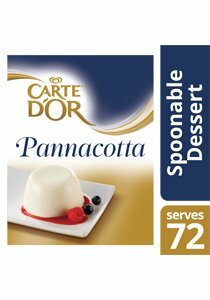 CARTE D'OR Pannacotta combines the richness of cream with the sweetness of vanilla to create a luscious chilled dessert. Place milk in a saucepan and bring to the boil. Remove from heat. Add CARTE D'OR Pannacotta Dessert Mix and cream, stirring well until combined. Portion and refrigerate at least 3 hours, or until set. Hint: Before serving, run a sharp knife between mould and Pannacotta to assist when turning out. Weight - 780 g makes 72 portions. Quick and simple to prepare, perfect for busy or low skill kitchens. High yield - excellent cost and portion control. Cost effective - high profit potential, quick to prepare versus scratch-made desserts. Cost effective option to pre-bought desserts, eliminates wastage. If part of the package has been used, re-seal and store in a dry cool place.